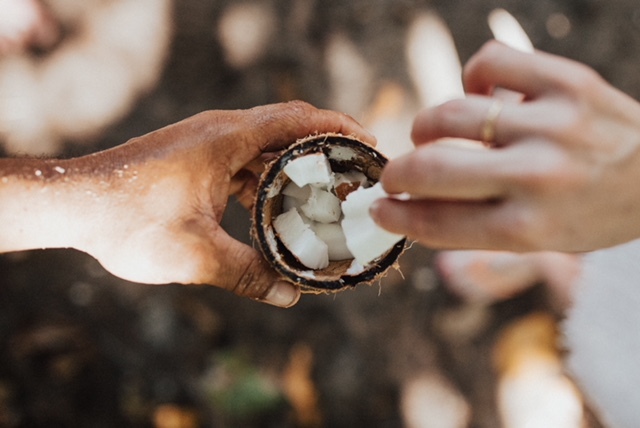 Our patients often ask us about oil pulling, or ‘swishing’: it’s an alternative treatment purported to rid your body of unwanted bacteria through the process of swishing vegetable oil (mostly coconut oil) around your mouth. Those who swear by the process claim that it whitens teeth, fights bad breath, and gets rid of bacteria stuck in hard to reach places. The longer you push and pull the oil through your mouth, the more microbes are pulled free. The oil needs to be swished around long enough for it to turn a milky white, which indicates that the bacteria has been “pulled” off. After roughly 20 minutes the solution is filled with bacteria, viruses and other organisms; at this point, the person spits out the oil and rinses thoroughly with water. People that “oil pull” state that it has helped whiten their teeth, alleviate halitosis, and even reduce gingivitis. In many cases, people also claim that it helps “prevent” cavities, as well as relieve gum and tooth sensitivity. There is clear evidence that many diseases and conditions are influenced by the mouth’s ecology and bacteria, and we understand the topic of oil pulling is valid when patients wonder why oil pulling has been encouraged by dental professionals as a supplemental therapy for patients, especially if we are in the business of “preventing” oral health problems. We support holistic approaches to your oral care. You just have to be smart about it and consider your individual dental health: there are certain types of infections that oil pulling will not resolve, and you have to be aggressive about treating those. It won’t take away raging gum infections or cavities. Oil pulling may remove bacteria, but it doesn’t kill bacteria, and that’s a big difference. If oil pulling is used alone, without regular brushing and flossing, then no, it is not an effective way to keep your mouth healthy. It will not heal existing decay. However, when used in conjunction with proper daily brushing and flossing habits as a preventive measure, it may improve bad breath, help to decrease staining, and benefit in other ways. If you have dry mouth issues, we absolutely believe pre-bedtime oil pulling can be helpful.